Buckskin Hill on 58 1/2 Road south of Collbran has slumped down approximately four feet from its original surface height. 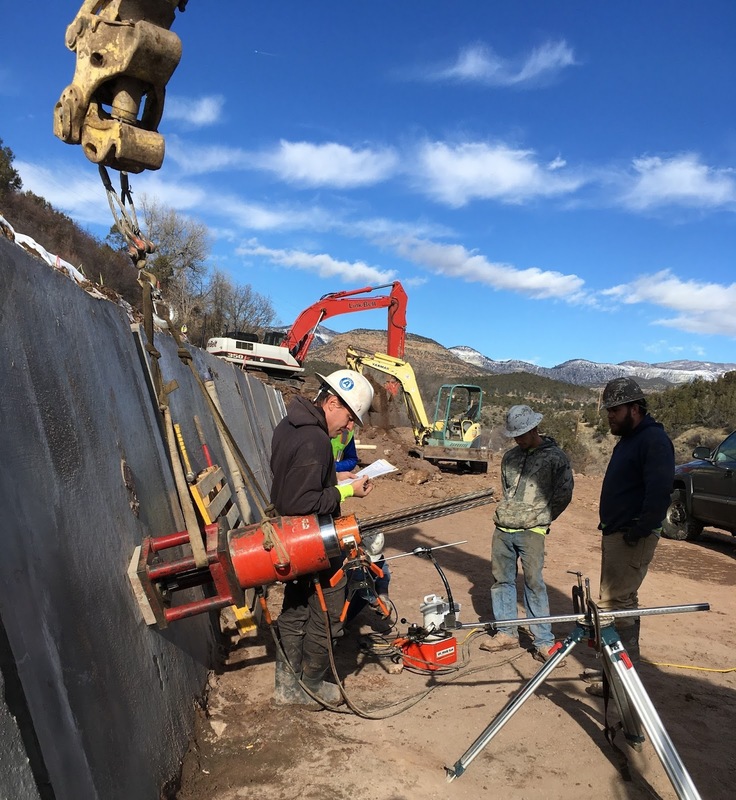 Mesa County has been working on road repairs and hill stabilization. The project will most likely be completed by next summer. Clerk and Recorder Sheila Reiner, Amanda Polson and Karen Reiher visiting Collbran Job Corps to present letters of recommendation to students for their excellent work in the election. Clerk and Recorder Sheila Reiner addresses the issue of how to maintain voter privacy and preserve secrecy in voting, while simultaneously allowing the public to inspect ballots. Election staff has already gone through 89,000 images to redact any marks that can reveal or tie back to a particular voter. So far they have made 47 redactions. Mesa County Health Department and the Mesa County Workforce Center hosted an ICS-300: Intermediate ICS for Expanding Incidents training on Wednesday and Thursday. 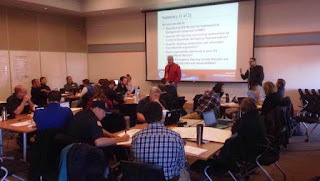 Montrose County Emergency Manager Don Angell (left in red) and City of Grand Junction Emergency Manager Gus Hendricks (right) trained a class of 30 people in varying response positions from across the Western Slope about emergency preparedness and how to handle an incident as it grows and evolves. The Mesa County Sheriff's Office had an anonymous resident donate bikes in Deputy Geer's name to hand out to children in the community. The Western Colorado Community College Peace Officer Academy Graduated 17 cadets! 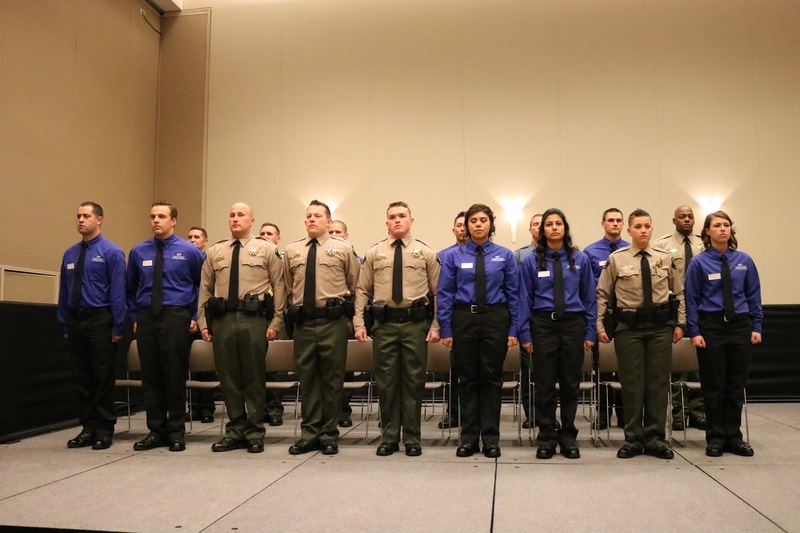 Six new graduates from theWestern Colorado Community College Peace Officer Academy are joining the Mesa County Sheriff's Office as patrol deputies, filling current vacancies. 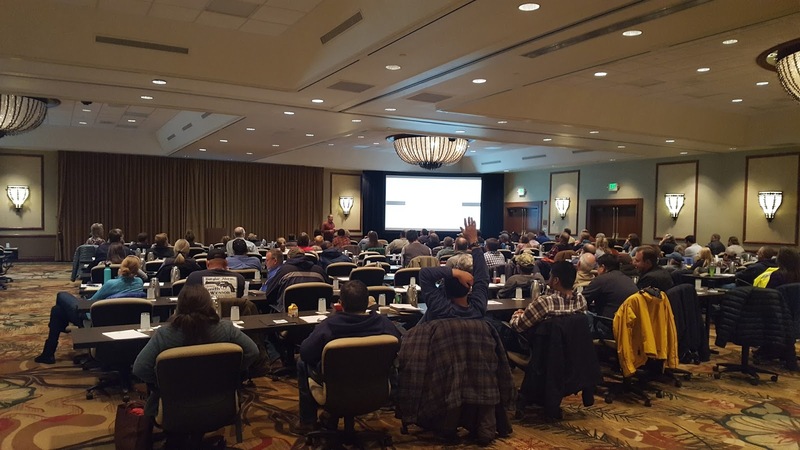 Weed and Pest Management Teresa Nees at the annual conference of the Colorado Weed Management Association in Colorado Springs. Ouray and San Miguel Counties Weed Management Mallory Vess, Department of Energy Danika Marshall and Marilyn Kastens and Mesa County Noxious Weed and Pest Management Teresa Nees at the annual conference of the Colorado Weed Management Association in Colorado Springs. The Mesa County Employees' Association. Members in the picture include Lori Seeley, Pam Hawkins, Lynn Zubek, Connie Robbins, Kristina Warren, Lorie Wuebold, Jane Hart and Tina Dugger. The purpose of the MCEA is to promote direct employee-employer relations in the interest of better County service. The MCEA works very hard to support Mesa County employees. They host an annual employee appreciation holiday social paid by association through fundraisers. Christmas duckies to spread the holiday cheer! On the menu: sliced roast beef, mashed potatoes & gravy, green beans, stuffed bell peppers. Sheriff's Office Carla Dittman enjoys a taste of gravy—finger-lickin' good. From right: Public Works Pam Hawkins serves Sheriff's Office Bernice Stogsdill at a holiday social for employees. Good turn out at the 2016 MCEA Holiday Social! Public Health Clinic Manager Allison Sanchez (left), Business Analyst Lindsey Barger and Data Analyst Shane Chatfield. Grand Valley Transit (GVT) is excited to announce a 50 percent discount on all GVT fixed-route passes to veterans. Veterans eligible for the discount GVT bus passes include all types of discharges except for those with dishonorable discharges. The Veteran Discount Pass Program is made possible through the collaboration of the Mesa County Veteran Services provided through Aging and Disability Resources of Colorado (ADRC), Veterans Affairs Grand Junction regional office and Grand Valley Transit. Mesa County has an estimated population of 14,000 - 15,000 veterans. Transportation services exist for a fraction of this population through various programs and agencies, but the community partners have discussed ways to help the veterans who are not eligible for those transportation services. “For those who gave so much to our country, we wanted to do more for the veterans in our community,” said Brian Oney, Veteran Services Officer under ADRC. Veterans who would like to take advantage of this discount pass program must have their veteran status verified by Oney, located at the Mesa County Workforce Center. Veterans can be verified by appointment only by calling (970) 248 -2733 or emailing brian.oney@mesacounty.us. After verification of veteran status, veterans can go to GVT West Transfer Facility’s pass office located at 612 24 ½ Road Monday-Saturday from 5 a.m. to 8:30 p.m. or the GVT Downtown Pass Office located at 525 S. 6th Street Monday-Friday from 8 a.m. to 5:30 p.m.to purchase any type of pass - day, month, annual, etc. Veterans must present a valid photo ID (i.e., driver’s license, passport, veteran ID, etc.) to GVT staff at the time of purchase. GVT strives to meet the diverse travel needs of the communities we serve. As GVT officials receive community feedback and review services, necessary changes are made. If you have questions about the Veteran Discount Pass Program, please call 256-RIDE or visit gvt.mesacounty.us and follow the “Fares/Passes” quick link. To assist with trip planning, customers may use the GVT Trip Planner online at gvteta.com or call (970) 256-RIDE (7433) from 5 a.m.. to 8:30 p.m. Monday through Saturday. The Board of Mesa County Commissioners this morning, in public hearing, proclaimed December 6, 2016, as Grand Valley Gives Day in Mesa County and invite everyone to donate to their favorite local non-profit organizations. 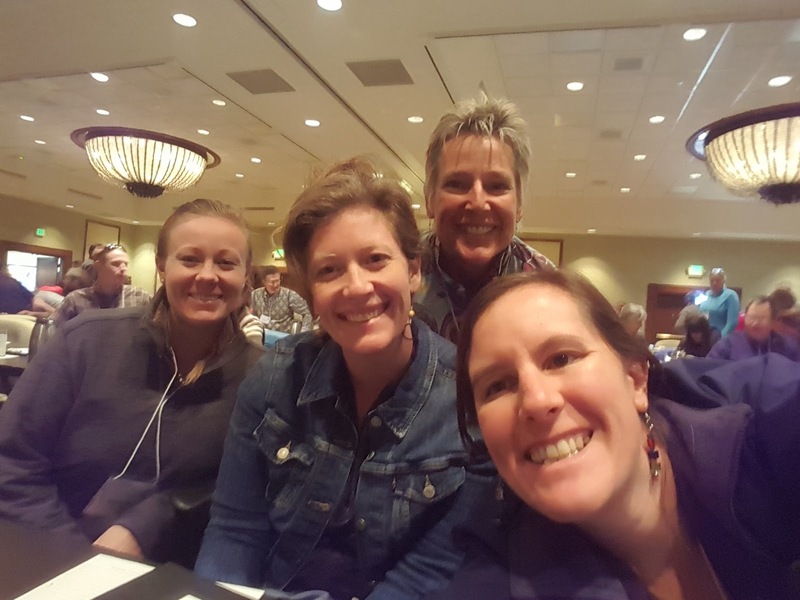 The Grand Valley Gives Collaboration was formed in 2012 on the Western Slope to increase awareness of giving back to the local community as part of the statewide movement of Colorado Gives Day. On Tuesday, December 6, 2016, 24 non-profit agencies will work together to raise over $150,000 to ensure that local nonprofits can continue to provide valuable services to the residents in Mesa County.